Designed to provide an inexpensive, reliable unit to monitor the presence or absence of flow in a system. The V10 flow switch is used to monitor unattended equipment and protect it from costly damage. 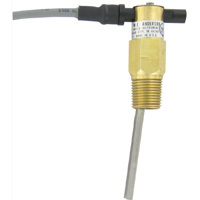 The V10 flow switch utilizes a rugged, hermetically sealed reed switch which is encapsulated in a polypropylene switch housing that fits into a standard heavy duty leak proof brass body or optional 303 Stainless Steel body. The patented switch adjustment allows the user to change the switch to Normally Open (NO) or Normally Closed (NC) in the field merely by loosening two screws. The switch housing is located outside the process media, making switch change-over or maintenance easy without interruption of process flow. A full size, trimmable stainless steel vane is provided with a removable laminated template. This template is calibrated for brass or ductile iron reducing tees and forged steel straight tee/bushing combinations. Allows for field installation in pipelines from 1/2" to 2" diameter. Service: Compatible gases or liquids. Wetted Material: Vane: 301 SS; Body: Brass or 303 SS; Pin and Spring: 301 SS, 302 SS, and 316 SS; Magnet: Ceramic 8. Pressure Limit: Brass body: 1000 psig (69 bar), 303 SS body: 2000 psig (138 bar). Electrical Rating: 0.5 A @ 30 VAC, 1.5 A @ 24 VDC. Electrical Connections: 18 AWG, 18" (460 mm) long, PVC jacket. Rated 221°F (105°C). Process Connection: 1/2" male NPT standard. Contact factory for other options. Mounting Orientation: Switch can be installed in any position but the actuation/deactuation flow rates are based on horizontal pipe runs and are nominal values. Set Point Adjustment: Vane is trimmable. Weight: 4.5 oz (0.13 kg). Agency Approvals: CE, UL and CSA.